We rent only from Friday to Friday in the summer. Gorgeous, renovated "eco"cottage on clear water of the Moon River with full sun, smooth granite rock, towering white pine trees and prime swimming for a true Muskoka vacation. 10 acres. The cottage has 400 ft. of river frontage and is on 10 acres of mature forest surrounded by extensive wilderness. Enjoy a tranquil, vacation with the family. The cottage has 400 ft. of river frontage and is on 10 acres of mature forest surrounded by extensive wilderness. Enjoy a tranquil, vacation with the family. There are no neighbours and no motorboats on the river so privacy is assured.The river flow ranges from extremely slow to swifter, depending on the water levels, and it is warm and of various depths for all levels of swimmers. The granite rock shore provides for easy access to step in or jump in to the water. There are water toys, a kayak and a canoe available. Hikers, runners and cyclists will enjoy many treed trails and laneways. 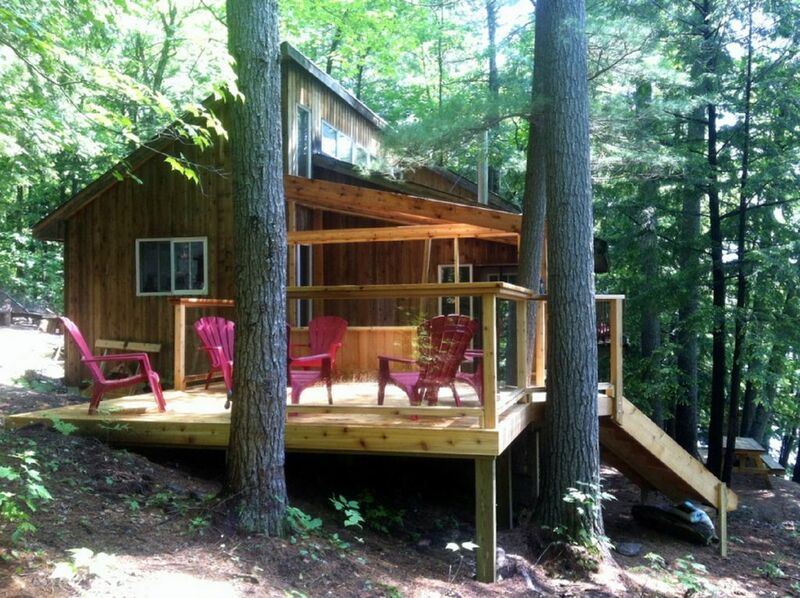 The cottage overlooks the river and is full of light, surrounded by towering white pine. Relax on the new deck, taking in all of the beautiful surroundings. The land is natural, without manicured lawns and extensive landscaping for a traditional cottage vacation. Unplug and enjoy! Children will enjoy the trampoline, tree house, hanging tire and giant swing! Master bedroom with queen bed. Guest room with double bed. Guest bedroom on second level with double bed and twin bed. The 2 twin bed mattresses can be unstacked to make two twin beds, for a total of 4 beds in this room. Inside the cottage, you will find a rustic Canadiana themed decor with beautiful artwork, hardwood floors throughout, and slate tiled bathroom. The large open concept kitchen-living room gives a spacious feel. The master bedroom has a queen bed, and a walk-out balcony - perfect for some quiet reading or morning coffee. The second bedroom has a double bed. There is a loft bedroom with a double bed - the loft is accessed by a Japanese ladder, and there are wood railings with tempered glass around the opening. There are large windows with screens which can open to let a nice breeze in. Guests will need to bring their own sheets/pillow cases, bath, beach and kitchen towels as there are no laundry facilities on site. There will be pillows and blankets on the beds. There is lots of room to prepare and enjoy meals, and relax for playing games or reading by the fire at the end of the day. Alternately, spend your evening toasting marshmallows over an open-air fire, or head down to the river for some fishing. This "eco" cabin is fully wired and is "off the grid" using solar system energy. The cottage is wired with 12 volts (you can recharge devices using a 12 volt car charger plug that you bring with you as there are outlets for this in the cottage but you cannot plug in 110 volt appliances). The high efficiency wood-stove keeps the cabin toasty in the winter. The fridge and stove-top run with propane (there is no oven). There is a propane BBQ. There is hot and cold running river water in the kitchen and bathroom sink, shower and bidet. Bottled drinking water must be brought in from town, where you can fill up for free. There is an enviro-compost toilet, a bidet, and an outhouse. The cottage is on 400 feet of waterfront that is accessed by a steep path and stairs from the cottage. We are happy to communicate with guests before their arrival. We will be either in Toronto or out of the country while you stay at our cottage. Our neighbour up the river oversees any issues that may arise while you are there. The cottage is serviced by a local cleaning agency between guests. They also check the condition of the cottage before and after your stay. Yolanda is an artist and art teacher and Carlos is a designer. We lovingly renovated the cottage into our dream home. We invite you to enjoy our private get-away for your next vacation. We are avid outdoors people, who love to canoe, ski, hike and travel. We spend our time between Canada and Spain. Carlos and I found the place we had been waiting for all our lives when we bought "Over the Moon" cottage. The towering trees, smooth granite rock and gorgeous Moon River! It is absolutely a stunning location. Such privacy, 10 acres surrounded by wilderness, is uncommon in the Muskoka region. All the creature comforts in this "off the grid" eco cabin. Unplug and re-connect with each other, outside or in. We have 400 feet of secluded river front with excellent swimming, towering pine trees on 10 acres of beautiful wooded property. Gas stove top with 5 elements. No oven. It's an off the grid cottage so no plug in appliances. We couldn't have asked for a better experience. The cottage is fully equipped with everything you need. We definitely brought more then we needed lol. The view from the cottage down to the water is spectacular. The water is warm and great for swimming and also a lot of fun fishing. It is off the beaten path but Yolandas directions were perfect and easy to follow. We also enjoyed going into the adorable town of Bala where you have everything you need! Overall a great time and we hope to go back!!! We are delighted that you enjoyed your time at our cottage. We have taken a lot of time and effort to create a place that we love and it is so rewarding to hear that others we share it with feel the same way. We'd love to have you back! The cottage was open and beautiful. The beds were comfortable. We loved the master bedroom with a balcony. We loved eating in the wonderful dining room. But the best part was the dock and waterfront. We swam several times a day, and went for canoe rides. A bit of a trek getting down to the water though. Being off the grid didn't bother us at all. It was a wonderful holiday. We had a wonderful time with our family (kids aged 3, 5 and 7). Nothing was lacking at all. And the scenery and swimmable water was so magical. Just close enough to town that you can enjoy the quaint Muskoka vibes of Bala and daily donut runs. But far enough off the grid that you really feel as though you are having a unique vacation and doing something special. If you are open to new experiences, and not just a standard cottage rental, give this place a go. We are so delighted to that your family had a great time at our cottage. The perfect way to unplug and breathe in the wilderness! We came here to celebrate my parents' 50th wedding anniversary and had the most amazing time at Over the Moon cottage! There was an unforeseen snowfall of over a foot a few days before my family was to check in. The snow made driving up to the cottage impossible and we had to haul our stuff up on foot, but even that could not deter us from having the BEST family vacation we've had in a very long time! The cottage is absolutely CHARMING! Once we got into the groove of how to function and conserve power in a solar-powered cottage and become accustomed to a compost toilet, everything was perfect. The kitchen was even fully stocked with all manners of pots and pans and utensils that you could ever need. Bala Community Centre, where we had to refill our drinking water supply (for free) and Eveleigh Road Transfer Station where we threw out our garbage were both nearby and no trouble at all (1-3 bags/week for free, each add'l bag is only $3/ea.). The stove fireplace, dock, the fire pit, the picnic table out back with a stone tabletop and log benches, the outdoor, screened-in add'l dining area... just DREAMY. We even found the attic really fun! And the fact that there was no wifi really made our family bonding time that much more intimate and meaningful. I can't wait to recommend Yolanda's cottage to our friends! We had a fantastic time, it is a lovely and well equipped cottage. Beatiful property, well equipped -we thoroughly enjoyed our stay! Joel was easy and straightforward to communicate with. He respected the house rules and left the cottage clean. We would welcome him back and recommend him highly as a guest. The lodge is situated above a nice river in a beautiful surrounding, It has plenty of room for a family holiday. Everything is eco-friendly and well-organized. Electricity is solar-powered. We had no problem with the system. The lodge was very comfortable for a family of five with various rooms to linger. Everything was well-tended and clean. The children loved this place, especially the provided water toys.The organization of our stay was perfect. Out cottage in a very private location of the popular Muskoka Lakes district on the Canadian Sheild. This is the land of towering pine trees, granite rock and clean flowing rivers and lakes.